The Bollée name is a very important one in the history of French automobiles. Amédée Bollée built some of the earliest steam cars beginning in 1873. Léon, his son, began building gasoline-powered cars in 1893. His Voiturettes are some of the best pre-1900 vehicles built. And those are what people usually think of when they hear the name Bollée. But his company actually lived on for a few more decades (Léon died in 1913). In fact, in 1924, the company was purchased by Morris Motors of the U.K. as a way for Morris to break into the French market. It went just okay and production ended in 1928 and the French company closed in 1931. This four-cylinder Type M is a four-door, five-passenger Roadster. If the entire car was restored (the interior definitely has been) it was done long ago, as the paint is showing its age. But where are you going to find another one? In the last decade, give or take, this is the first post-WWI Léon Bollée car that I can recall seeing (actually, it’s the first post-1900 Léon Bollée car that I can recall seeing). It should bring between $30,750-$37,000. Click here for more info and here for more from this sale. 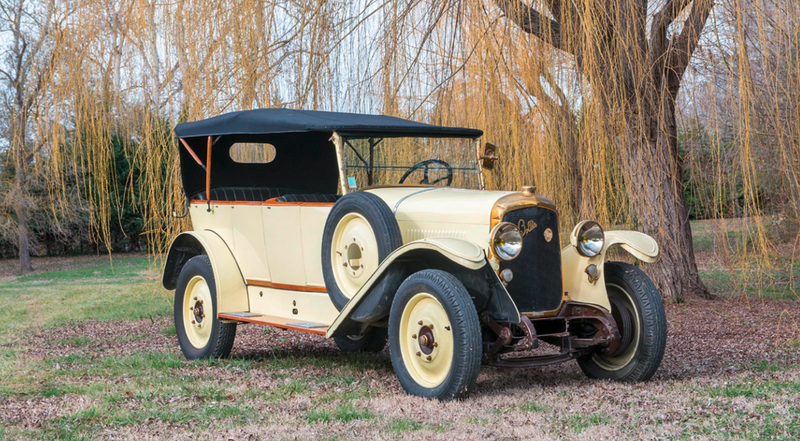 This entry was posted in Uncategorized and tagged 1923, auctions, cars, classic cars, leclere mdv, leon bollee, roadster, type m by classiccarweekly. Bookmark the permalink.